As an infant, Aloy is put under the care of the outcast Rost by the Nora Matriarchs. Due to the mysterious circumstances of her birth, as well as her status as an outcast, Aloy is often persecuted and shunned by the rest of the Nora tribe. As a child, she accidentally falls into an ancient bunker built by the Old Ones, and takes possession of a Focus, a small device that gives her special perceptive abilities as well as the ability to interact with machines and Old One technology. Later, she becomes curious about the identity of her mother and decides on winning a competition called the Proving so she can win the right to ask the Matriarchs directly. Rost spends several years training Aloy in preparation for the Proving, teaching her how to hunt, fight, and survive. Once she comes of age, Aloy takes part in the Proving and meets the foreigners Erend and Olin, with Olin having a Focus like Aloy. Aloy manages to come in first place, but a band of cultists suddenly attack, killing many Nora. Aloy is able to kill several cultists and is shocked to find that they are equipped with Focuses as well. Rost sacrifices his life to save Aloy, and Matriarch Teersa takes Aloy into the Nora’s sacred mountain to nurse her wounds. When Aloy awakes, Teersa explains that after the Proving massacre, the Nora attempted to retaliate against the cultists but their war party was annihilated by corrupted machines under the control of the cultists. Teersa also reveals that Matriarchs first found Aloy at the foot of a sealed door that they worship. While Teersa sees Aloy’s “birth” as a sign from the gods, the other Matriarchs fear it means Aloy is cursed. Aloy approaches the door and it reacts to her presence, but refuses to open. She resolves that the only way to find answers is to track Olin, since he had apparently used his Focus to tip off the cultists to Aloy’s existence. With Teersa’s blessing, Aloy leaves Nora lands to head for Meridian, the capital city of the neighboring Carja tribe. Along the way she helps War Chief Sona exact revenge on the cultists by hunting and killing the ones that remain in Nora lands. 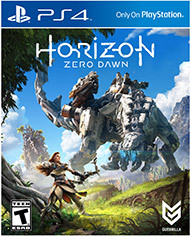 Upon arriving in Meridian, Aloy searches Olin’s house and discovers that the cultists are holding Olin’s family hostage, forcing him to act as their spy and to help them excavate corrupted machines. Afterwards, Aloy confronts Olin, who tells her that the cultists are part of a fanatical religious group calling themselves the Eclipse who worship a demon called Hades, who allows them to corrupt machines. Meanwhile, Aloy receives assistance from a mysterious stranger, who is able to disable Eclipse Focuses. Following Olin’s information, Aloy heads for an Old One ruin at Maker’s Rise, which turns out to be the corporate headquarters of Faro Automated Solutions. She is allowed access inside the building due to her genetic similarity to a Dr. Elisabet Sobeck. By investigating the building, Aloy discovers that the world was put into peril nearly one thousand years ago due to Faro losing control of its automated “peacekeeper” robots, which were designed to be self sufficient and able to convert biomass into energy. However, the world was narrowly saved thanks to Project Zero Dawn, which was spearheaded by Dr. Sobeck. Aloy is then contacted by Sylens, her anonymous benefactor. Sylens is a researcher interested in what happened to the Old Ones, and directs Aloy to Dr. Sobeck’s last known location: US Robotics Command. Aloy reaches the ruins of USRC and learns that the US military sent Dr. Sobeck to an Orbital Launch Base in Utah to complete Zero Dawn while they try to buy time against the robot swarms. However, Sylens reveals that the base is located under the Citadel, the center of Eclipse power. After sabotaging the Eclipse Focus network, Aloy heads for the base. Inside, she learns that Zero Dawn was in fact was not meant to save the Earth, as nothing could stop the rogue Faro robots from destroying the planet and annihilating all life. In actuality, Zero Dawn was instead a vast underground system of databases, factories and cloning facilities all controlled by a single artificial intelligence named GAIA. Once all life had been extinguished, GAIA would eventually develop a countermeasure necessary to deactivate all of the Faro robots within the safety of its underground facilities, and then build its own robots to restore the Earth’s biosphere once the Faro swarm had been destroyed. Once the planet was habitable again, GAIA would reseed life on earth based on stored DNA and hopefully teach the first human clones not to repeat their predecessors past mistakes. It is also revealed that HADES is in fact one of GAIA’s subsystems designed to enact controlled extinction if the outcome of Zero Dawn was not favourable for human existence. Aloy then reaches Dr. Sobek’s office, where she downloads an uncorrupted registry that would give her access to the door she was born from. However, she is captured by the Eclipse leader, Helis. Helis gloats to Aloy that he has already ordered his Eclipse forces to exterminate the Nora tribe before destroying her Focus and throwing her into a robot arena to die. Fortunately, Sylens arrives and rescues Aloy, giving her a new Focus. She returns to the Nora tribe to help fight off the Eclipse invasion. With the intact registry, she is finally able to enter the door beneath the Nora mountain. There, she finds a recording left behind by GAIA, revealing that HADES had gone rogue and attempted to seize control of her functions. As a last resort, GAIA self destructed her own core to stop HADES. However, without GAIA to maintain the terraforming process, the entire system began to break down, resulting in the Derangement. As a contingency plan, GAIA created Aloy with Dr. Sobeck’s DNA profile, in hope that she would find GAIA’s message, destroy HADES, and restore GAIA’s functions. Upon investigating the destroyed GAIA Prime facility, Aloy learns Dr. Sobeck sacrificed her life to ensure the Faro swarm wouldn’t find GAIA. Then, Ted Faro, feeling guilty for his part in creating the Faro robots, destroyed the APOLLO education system to prevent the next generation of humanity from gaining the same destructive knowledge and killed the other GAIA Prime staff to prevent their interference, resulting in the primitive society the game takes place in. Aloy manages to obtain the System Override necessary to destroy HADES. Sylens admits that he was the original founder of Eclipse, originally tempted by HADES’ promises of knowledge, until he was no longer any use to HADES. Aloy surmises that HADES wants to seize the Spire in Meridian in order to send a signal to reactivate the Faro robots so that they can wipe out all life on Earth again. Aloy returns to Meridian to warn them of the attack, and rallies all of the allies she can muster. The battle is fierce, but Aloy is able to defeat both Helis and HADES, ending the war. Aloy is celebrated as a hero and she journeys to Dr. Sobeck’s home, where she finds her corpse, and has a moment of mourning for her mother.